"I may not be around for the next year's festival," said the old man. "But you are here now," said I, "and so am I. Let's toast to that!" "Sure! ", he said, and smiled. It was only a couple of days after my old mother’s passing, and I was going to a party. Some people would have second thoughts about that, but I didn’t. After all, here in Japan, we grieve when people die, but we also dance when they return once a year. I think even the dead prefer to dance to tears and grieving. This night would, indeed, turn out to be one of my happiest since I settled down in Japan almost three decades ago. But I’m getting ahead of myself. I would never have had this experience if not for a band of happy old ladies I’d chanced upon some weeks earlier. We had gone on a little photo excursion to a secluded part of Tajimi called Suwa Town. It's a tiny village up in the mountains. Many people living in Tajimi – which is not a big town, but a respectable size to a Swedish country boy like me – seem to be unaware even of the existence of this little hamlet. In fact, being hard to find seems to be the point of the place. Apparently, warriors and their families on the losing side of a conflict centuries ago fled here to hide from their enemies. The view that opened up to us as we entered the area looked like something from the world of Tolkien's hobbits. Trees were climbing up the cliffs around a flat area in the middle. There were crops growing in a field down there, and little houses were scattered on the surrounding hills. A bit further up the road, next to the only official-looking building I could see, was a large, ancient tree. ​​​​It was a wonderful summer day, with the sun blazing from an azure blue sky. By the road was a little rye field on a slope, and a man in a big straw hat was cutting the crops with a sickle, slowly advancing in a squatting posture. “Hey, that looks like hard work!” I shouted, waving my hand at him. He smiled and waved back. On the same side of the road was a staircase on a hill that led to a portal of the type you find at the entrance of a Shinto shrine. We climbed the stairs and had a look around. Another staircase continued up to a little shrine. I was cooler here, in the shade of the trees, and we took some time to shoot a few 360 photos. Back down again, we started to look for good spots to place the 360 VR camera to best capture the field and surrounding village, when we heard a burst of laughter from that official-looking building up the road. I paused, waiting for someone to appear from the building, but when nothing happened I returned to setting up the camera again. A few moments later, another big burst of laughter erupted from the building, and then another. Judging by the voices, apparently, a group of women was having an awful lot of fun in there. It was a mystery that we could not leave unsolved, so we walked up the road to the building and entered. Inside, sitting around a table, we found a group of elderly ladies chattering away. When they laid eyes on us, they broke out into a great cacophony, apparently totally surprised by the unexpected visit from a foreigner. The sight of me must have been nothing short of otherworldly – I am rather big, bulky and white, like a polar bear, an appearance as rare here as it is in the deepest jungles of Congo. What happened next could best be described as a welcoming party. The ladies were overjoyed by their new company, and one of them even went to her house to fetch a present for me. It turned out to be a box full of sake bottles. The pizza baker harvesting his crops. We are happily walking down the road. ​​It's been almost thirty years since I moved to Japan, and I have enjoyed many festivals, but this one was certainly one of the nicest. If you ask me why, it was not because it was the wildest or the largest. It was tiny, and very orderly. But what was so refreshingly different and lovely about it was just that: the tiny scale, the orderliness, and above all, the friendliness of everyone. 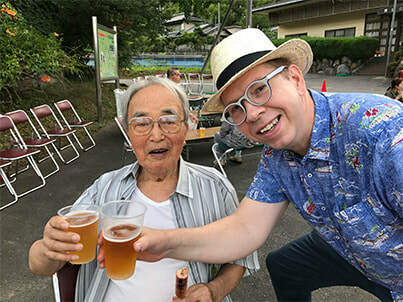 I was greatly flattered by the fact that a couple of the nice old ladies from that little tea party a few weeks earlier had dressed up in beautiful yukatas – a kind of pajamas version of the kimono – so that they would look their best for me when I arrived. Or, so I imagined. Perhaps it was a gesture to all of us outsiders. Even so, they looked so pretty in their flower-patterned yukatas that I convinced myself it had to be for me. It seemed like almost all of the two hundred villagers, young and old, were taking part. Everyone seemed to have a lot of fun. Drinks and food abounded, everything was free of charge, and everyone partied away merrily as the night fell over the little hamlet. Small kids played with tiny goldfish in an inflatable mini-pool, and there was popcorn and a bar – did I mention that the drinks were free? 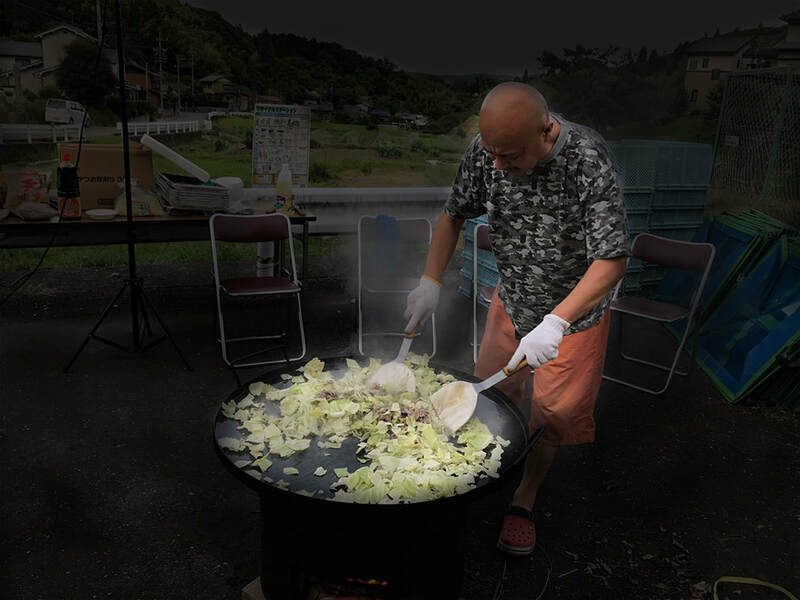 – and soba noodles being fried in a huge iron pan. And in a nearby small field, red lanterns had been strung up to light the ground so people could dance. Everyone was eager to talk to me – the first foreign participant in the festival, apparently. I was called by one of my friends to come over and speak English with two young girls who were drinking beer together with their smiling parents. Their father started a conversation in English with me too, which made the two girls laugh hard. He stumbled awkwardly on the few words he knew, but ignored it and kept talking anyway. It was wonderful to see in a land where everyone normally dreads making a mistake. Well, the beer helped, of course. There should be more beer available for language students in this country. There was an old man who seemed to have forgotten to shave for a few days, and although he said he believed he would probably not be around long enough to see another festival, he smiled and beamed with happiness. Life is not about worrying about the future, or regretting the past. First and foremost, it is about enjoying the present, which is all we really have. That is what he seemed to say, although he didn't put it into words. As it started to grow darker, someone shouted that we would be able to see the International Space Station crossing the sky in a few minutes. I had no idea in what direction to look, or how fast it would pass by. Would it be over in moments? I tried to concentrate on scanning the sky, but in a while my neck started to hurt, and I began to lose concentration. Had the thing already passed us? Suddenly people started to shout and point, but it turned out to be a plane. Then we saw it. A shooting star, only it didn't seem to fall, but continued its silent passage horizontally across the sky, slowly, until it began to grow smaller and smaller and fade away in the distance. Strange to think that there were people in that thing. Our age is moving into the future at accelerating speed, while we still drink and dance like we did a thousand years ago under the starry sky. Now music started to flow from the dancing ground, and people began to dance in a wide ring, illuminated by the red light from the lanterns. They do like dancing, these people. I wish my old mother could have come to see them. She had planned to go, once, although she was already growing old by then and had never traveled abroad. She’d even bought a suitcase and was getting ready for the trip, but eventually gave up. She would have loved to see the dancing, and the festivals, and all the wonderful greenery and flowers in this country. She was loved flowers, which she grew in pots inside her home. Here, exotic plants grow everywhere. ​But most of all, she would have loved this festival. There was such warmth and friendliness – even the breeze felt warm and friendly that night. 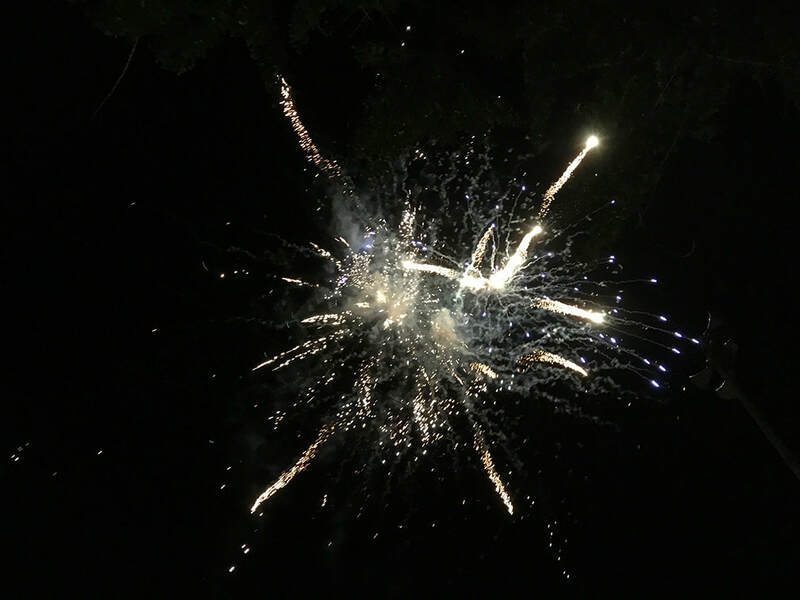 And when the dancing was over, fireworks started to shoot into the evening sky, and in the end, as the climax, waterfall fireworks lit up the people as they gathered beneath. Their faces changed from green to red to white as the waterfall sparkled and changed colour. “He had observed the stately procession of the priests in their white vestments and black headdresses and black wooden shoes. He had heard the eerie risings of the spirit-like music, the pluckings of the koto, the alternating light, and heavy drumbeats, the wind instruments and great gongs mingling with the sounds of wind and pines and sea. He had watched the heavily garbed dancers, some masked, others not, moving in dreamlike trance against intoned utterances. Then the whole thing would be over, the ritual done. But what did it mean? 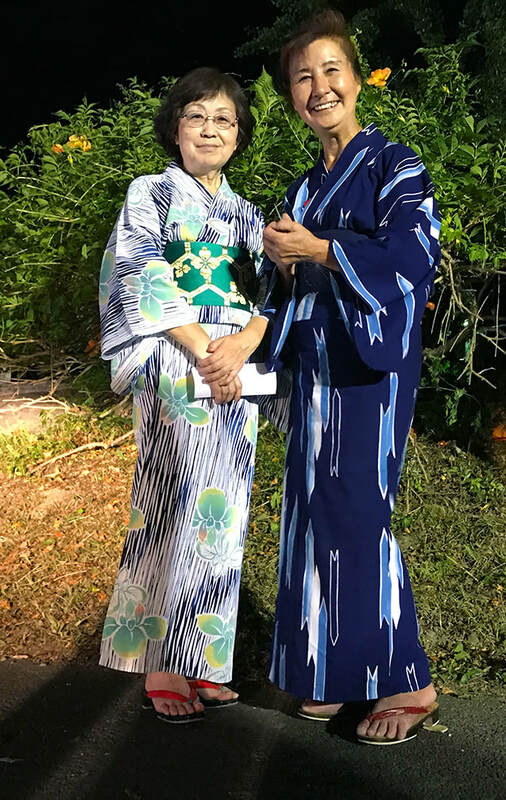 Two of the happy ladies from our first visit dressed up in their best yukata for the evening. This story is dedicated to the author's mother, Eva, who passed away quietly at the age of 96, on the 19th of July, 2017, shortly before this piece was published.